Members need to sign in through the member login page to book a court. Club play hours are determined by our City permit. Our hours are 7:00 am – 11:00 pm Monday to Sunday, as per our permit, and subject to organized activities and daily court maintenance. Juniors may tag up and book our reserved court during Family Time on Saturdays. While we refer to our court surface as “clay,” in reality it is composed of compacted, water- saturated crushed rock called “Har Tru.” It has to be swept and watered a number of times a day and rolled often to be cool, and soft and firm at the same time. Because the clay is a soft surface and requires regular maintenance, we have to treat it with respect. Therefore, please wear only proper “clay tennis shoes” with a shallow smooth pattern like “herring bone” and round edges. What is so Special About Playing on Clay? The loose particles of clay allow the player’s tennis shoe to slide to gentle stops. This is one of many advantages of clay court tennis. These soft stops prevent injuries to tendons, muscles and ligaments that we might otherwise face playing hard court tennis. 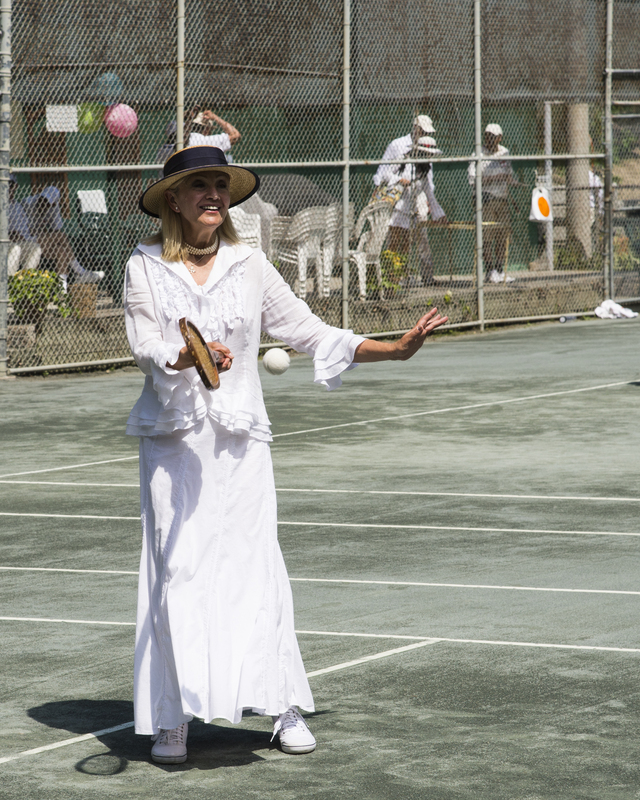 Because the clay is also gentle to body joints like the knees and hips, our more senior players can enjoy vigorous tennis late into their years. On very hot days, players will find our courts much cooler to play on than hard courts. This is because the water contained in the clay evaporates continuously and self-cools the surface. Where hard courts “burn” your feet on a hot summer day, the clay stays comfortably cool. Another advantage of clay courts is that they usually dry very quickly after a rain. Unlike hard courts, which need to be sponged off to disburse the water, rain is absorbed into the clay and courts are often playable within a short period after the rain ends, with no manual intervention required. Of course, lengthy downpours may require longer periods to dry. After very heavy rain, it is important not to go onto courts that are still wet as this will cause the surface to become uneven. We ask players to vacate the courts when requested by our Court Monitors to allow for the maintenance which helps keep our courts in excellent playing condition. Clay courts are a much more forgiving surface than hard courts, but it takes a lot of work to keep them soft, smooth, and enjoyable to play on. Though we expect maintenance will usually be completed within one hour it may take longer. In an effort to keep our courts in great shape it has been recommended that we increase the number of times that our courts are swept during the day. If time allows, after play, or following participation in a club program, please drag the courts and sweep the lines when your session is completed. If the courts are dry, members who feel comfortable doing so may also give the courts a light hand watering. The hoses can be found along the side fence on courts 1 and 3. If you are interested in helping prepare our courts in the spring or assisting in closing the courts in the fall, look for the call for volunteers in our newsletter. Special thanks to our Court Monitors for keeping the courts in such great shape. If you are interested in helping prepare our courts in the spring, look for the call for volunteers in our newsletter. Members should direct any comments to our Courts Director (at Courts@LawrenceParkTennisClub.ca) and not to an individual worker or volunteer. Volunteer members, David Douglas and Mark Girdler, were reminded of the history of Lawrence Park Tennis Club when installing a new pipe anchor (the device that is anchored in the court and to which the centre net strap is fastened). 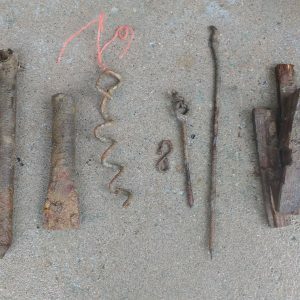 They unearthed some red clay and four generations of anchors. There are two ways for members to book a court: first come, first serve using our tag up board or pre-booking 6 days in advance using our on-line tennis booking system, either at the club, from home or your mobile device. Courts cannot be booked by leaving telephone messages. Tagging up hours on courts one and two are available anytime the courts are not committed to maintenance or programs – whether those be house league or team matches, round robins, junior instructional programs or other special events. In order to see what times are available for tag up play, members may visit the court schedule on our website. On the tag up courts, court time is regulated by the tag up board. Every member has a tag with their name and number (an alphabetical listing of all members and their tag numbers is posted underneath the tag board for easy reference). Upon arrival, members place their name tag on the available (non-booked) court and time they would like to select for play. If members are part of a pre-arranged group, the other members of the group add their names to the selected court and time as they arrive at the Club. Members who are not present to play, should not have their tags on the tag board. Specifically, members cannot put up a tag for someone else who has not yet arrived nor put up ones own tag and then leave the Club. If a member has brought a guest, there are “Guest Tags” at the bottom of the master board which should be placed with the member’s tag on the chosen court time. If the member is not part of a pre-arranged game, they can hang up their tag on an available court and invite other singles to add their names. In all cases, if the four spots on the tag up court have not been filled by the selected court time, those tagged up on the court must offer the open spot(s) to those waiting. Members may not save a spot for someone who is not present at the club at the time the court becomes available for play. If an online bookable court has NOT been pre-booked at the selected time, it is available for tagging up as well. Members must check the online system to determine whether the online bookable court(s) is available. In the event that members who have reserved an online bookable court do not take the court within 5 minutes of the reservation time, the reserved court will become available to players to tag up. Players should promptly exit their court at the end of the play period and either put their tags up on any available tag up court if they wish to play again, or back on the master tag board in proper numerical position if done for the day. Court play periods consist of 1 hour during daytime and generally 45 minutes in the evenings when play time is staggered. One hour periods may be changed to 2 half hour periods if eight or more members are waiting for a court. All play during tag up hours is doubles play unless no one is waiting to play in which case singles matches can be played. The tagging board can be tricky for new members but there are instructions posted near the board and newer members can always ask another member. The board is designed to give all members a fair and equal play/wait ratio. Reservable court(s) may be booked online anytime the courts are not committed to maintenance or programs – whether those be house league or team matches, round robins, junior instructional programs or other special events. In order to see what times are available for tag up play, members must login through the Member Login tab and then click on Courts & Events. The schedule of bookable courts will be available after entering a login and password. Reservation System—Court 3 at all times; Court 2 weekdays 8: 30 pm-11pm and weekends 4pm-11pm. Reservations may be booked for either singles or doubles, 6 days in advance for 1 hour or 45 minutes of play. We have an on-line tennis booking system available for booking online court(s) and viewing pre-scheduled events on all three courts. Our tennis booking system is accessible via the member section of the LPTC website. To use the booking system, you login exactly the same way you do to register membership through our Lawrence Park Tennis Club Website ‘Member Login’ page. Once you log in on the LPTC site, you will not be required to log in again to the tennis booking system. In the Members’ Area of the website you will see a list of options on the top of your screen, click on ‘Courts & Events’ and it will automatically direct you to the tennis booking page. Use the same Username and Password that you use to register for membership. You will need to remember your Username and Password if you use the computer at the club to book a court. If you are not comfortable using the online system, we will happily give you a lesson. Please reach out to vice-president@lawrenceparktennisclub.ca. If you want to book a bookable online court, hover over the ‘Available’ booking slot which will light up with yellow dots and then click there. 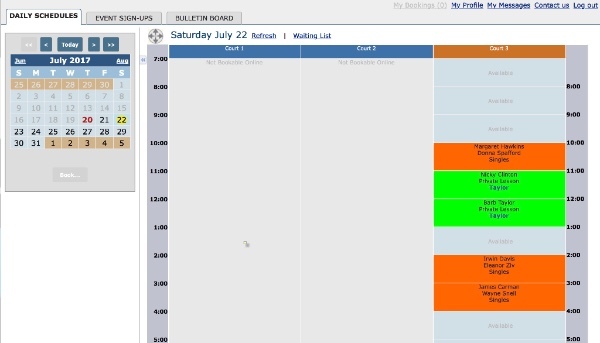 The option to book will appear on the left under the monthly calendar. Click the ‘book’ button. On the tagboard, tags indicating online bookings are hung up on bookable courts. 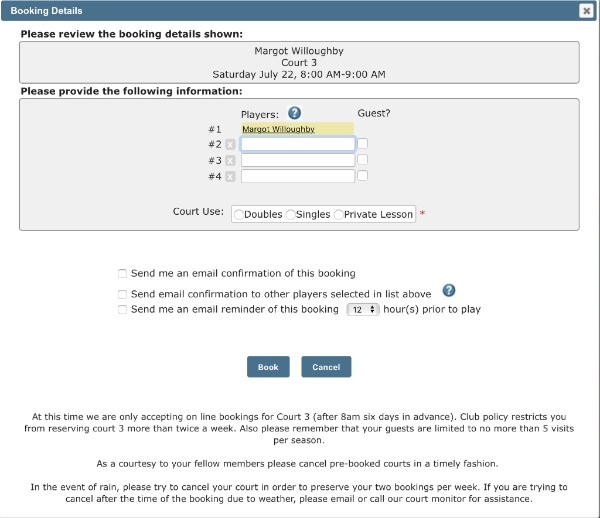 Members looking to tag up should check the court schedule screen to see if there is space available on any of these courts The online booking system takes precedence over the tag board for the purpose of determining court availability. In the event that members who have reserved an online bookable court do not take the court within 5 minutes of the reservation time, the reserved court will become available to players to tag up. If a member is unable to use an online booking, they should delete the name(s) from their on-line booking. This will allow other members to take advantage of the unused court time. In order to allow maximum enjoyment of court time, doubles will take precedence over singles on tag up courts. Specifically, if members have tagged up to play singles and other members arrive within the first 5 minutes of play time, those playing are required to double up. After 5 minutes into the court period, whether to invite members arriving to join play is at the discretion of those using the court. If no one comes to claim a court within 5 minutes of the start of the period, players on the court may move their tags and continue to play and members who are playing singles may continue to play singles. 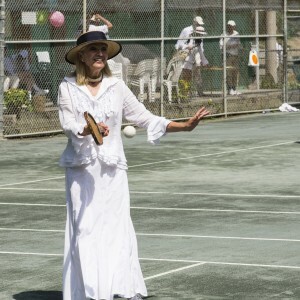 Each Member may play on the bookable courts no more than 2 times per week, and no more than once in the daytime and once in the evening on the same day. A lesson booking is considered one of your 2 allowed reservations per week. Members must allow all non-participating members to tag up before them when the program ends (i.e. program participants must sit out the first tag-up session on each court unless there are no members waiting for a court). Likewise a member about to come off a court who has been playing during non-programmed playing time must not put their tag up for another court period before their current court time is over. Members coming off court cannot be ahead of any player tagged up when the court changeover takes place.